The Finnish Disco – relating to the FUTURO house by Matti Suuronen – enters the 2nd round. 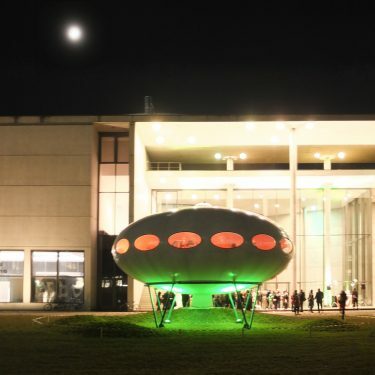 Thursday, February 28, 2019, starting 5 p.m.
To Finnish dance music, blueberry cake and glögi – the Finnish mulled wine – we will test how well the FUTURO House by Finnish architect Matti Suuronen, which was originally designed as a ski cabin, is suited to an après-ski and after-work party mood. Well known BR-Zündfunk presenter Achim Bogdahn will be at the decks and entertain with music from his extensive collection of Finnish records. The Finnish disco is a cooperation with our media partner Zündfunk / Bayerischer Rundfunk.